There's no controversy this year. Oregon's Marcus Mariota will win the Heisman Trophy. The only question is whether Mariota can win by a record margin over Wisconsin's Melvin Gordon and Alabama's Amari Cooper. For those looking for drama in the Heisman race, better luck next year. By the time the voting deadline passes Monday evening, Oregon quarterback Marcus Mariota will almost surely be elected the winner of the 80th Heisman Trophy. Mariota put the cap on a spectacular season in Oregon’s rout of Arizona in Friday’s Pac-12 title game. The only suspense at Saturday’s ceremony in New York will be what Mariota’s winning total is and whether he can surpass O.J. Simpson’s record 1,750-point margin. But first, a disclaimer: The following list does not represent my personal Heisman ballot. The Heisman Trust does not allow voters to reveal their ballots until after the ceremony. This rundown is simply how I expect the race to unfold, with three finalists. Oregon coach Mark Helfrich said last week that he and Mariota didn’t mention the word “Heisman” much during the season. But Helfrich wasn’t afraid to discuss the hardware after his Ducks beat Arizona, 51-13, to win the Pac-12 title. Mariota left a lasting impression Friday as he ripped through Arizona’s defense for 346 yards of offense and five total touchdowns. The quarterback extended his own Pac-12 single-season record for total touchdowns (53) along the way. Mariota finished the year with 10 games in which he scored four or more touchdowns, the most of any FBS player in 2014. He, along with his team, entered the season with something to prove. The Ducks had been labeled “soft” due to back-to-back losses against Stanford and its vaunted defense in in 2012 and ‘13. Those losses helped to keep Oregon from playing for a national championship despite its string of success against nearly every other opponent. The losses to Stanford are also why Mariota has never enjoyed a trip to New York as a Heisman contender. The Ducks’ redshirt junior finished his Heisman campaign as the nation’s leader in passing efficiency (186.3) and the only quarterback to average more than 10 yards per attempt (10.2). Mariota also threw just two interceptions this season. So what will put Mariota over Melvin Gordon and Amari Cooper? In short, quarterbacks have captured Heisman voters during the last 15 years. If Mariota wins, he’ll become the 13th quarterback to win the Heisman in the last 14 seasons. The trend of dual-threat passers is even more pronounced in recent years, as Mariota is vying to become the fifth running quarterback to win since 2007. While Gordon and Cooper have put up impressive seasons at different positions, Mariota’s overall production at quarterback against a tough Power Five schedule will help him claim the trophy. Fair or not, Gordon needed a monster performance in the Big Ten title game to gain more traction in the Heisman race. Unfortunately for him and Wisconsin, the Badgers and their star failed to show up against Ohio State in Indianapolis. After averaging 241 rushing yards during his last four games, Gordon stumbled against the Buckeyes. He finished with 76 yards on 29 carries -- 112 yards below his season average -- while Ohio State’s Ezekiel Elliott set a Big Ten title-game record with 220 rushing yards. Gordon’s longest run went for only 13 yards, the first time he failed to record a rush of at least 20 yards in a game all season. Gordon also lost a fumble in the second quarter that turned into a touchdown as Ohio State’s Joey Bosa used the scoop-and-score to give the Buckeyes a 38-0 lead before halftime. One bad game isn’t enough to keep Gordon from reaching New York as a finalist. He’s still the national leader in rushing yards (2,336) and rushing touchdowns (26). Gordon also has 31 rushes of 20 yards or longer this year, more than 118 FBS teams. It’s hard to argue that Gordon isn’t the best running back in the country. But Heisman winners step up on the biggest stages. Saturday’s stage was as big as it gets for Wisconsin, and Gordon wasn’t able to make a statement. His body of work should still earn him a runner-up spot in the Heisman race this weekend, though. That would mark the highest finish for a running back since Alabama’s Mark Ingram won the trophy in 2009.
Cooper looked poised for a strong ending to his Heisman campaign after a 224-yard, three-touchdown outing in the Crimson Tide’s Iron Bowl win Thanksgiving weekend. In Saturday’s SEC title game, however, the Alabama player delivering passes to Cooper stole the spotlight. 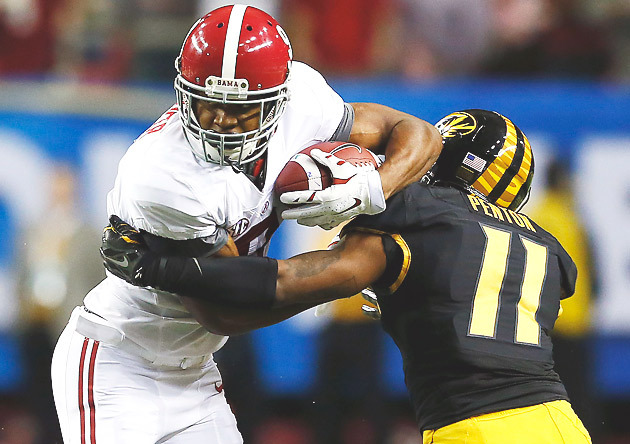 Quarterback Blake Sims earned MVP honors with a strong game (23-of-27 passing, 262 yards, two touchdowns) in a 42-13 win over Missouri. Cooper hauled in a respectable 83 receiving yards, but he was not dominant. His 6.9 yards per catch was his lowest average of the season, while fellow Alabama receiver DeAndrew White took over the big-play mantle with four receptions for 101 yards and a touchdown. Cooper needed an earth-shattering performance against Missouri to stand any realistic chance at claiming the Heisman. Receivers are at an inherent disadvantage in the race; when they enjoy good seasons, that often means their quarterbacks do, too. As the quarterback in Lane Kiffin’s up-tempo offense, Sims played a major role in Cooper’s emergence as the best receiver in the country. Of course, Cooper’s talent shouldn’t be ignored. He finished his Heisman campaign as the national leader in catches (115) and receiving yards (1,656). Those 115 receptions set a new SEC single-season record. But the fact is Cooper wasn’t the best player on the field Saturday, and he’s not the best player in the country this season. Still, his efforts more than warrant a trip to New York, where a third-place finish would mark the best Heisman run for a wide receiver since Pittsburgh’s Larry Fitzgerald claimed runner-up in 2003.